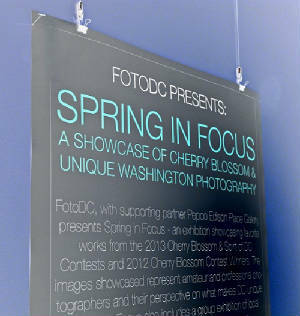 I have several pieces in the 2013 Spirit of DC/Spring In Focus Photography Exhibition. The show was held at the Pepco Edison Gallery (702 8th Street, NW). The photographs were selected by Gina Martin (National Geographic) and Christopher Addison (Ripley Fine Art). Gina Martin has worked with National Geographic since 2000, and she is very active in the arts community mentoring emerging photographers. Christopher Addison has worked as Chief Designer for the Renwick Gallery - specializing as a consultant in international fine art. The Pepco Edison Gallery sponsors a series of diverse, high quality art exhibits throughout the year.